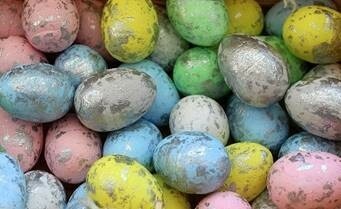 With Easter fast approaching, Cotswold District Council is urging residents to reduce waste and avoid buying chocolate eggs which have non-recyclable packaging. While the foil used to protect Easter eggs is easy to recognise, some foil packaging is harder to identify. One way to find out if an item is foil or metallised plastic film, is to do the ‘scrunch test.’ Simply scrunch the item in your hand – if it remains scrunched it is foil and can be recycled; if it springs back it is probably metallised plastic film and not recyclable. Common items mistaken for foil include cat food pouches and most crisp packets and therefore should not be placed in the foil recycling banks. Residents with aluminium foil to recycle can take it to the Household Recycling Centre at Fosse Cross or one of the recycling banks in the District– just go to https://www.recyclenow.com/local-recycling and insert your postcode to find the nearest one that accepts foil. During Easter, residents are reminded that there will be no change to the waste and recycling collection schedules in the Cotswolds. The crews will continue to collect at the kerbside on Good Friday and Easter Monday as usual. External Website: More details about Cotswold District Council and Please don’t forget to recycle during the Easter break!